Upsy Daisy is a great stamp, and its versitility makes it ever more a reason its always within arms reach. 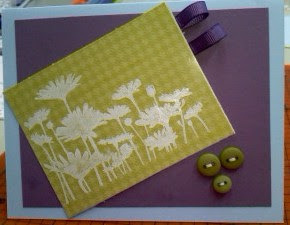 I used it on clear sheets, making it look like a window sheet, with white craft ink. Then I paired it with the green Urban DSP, which I believe is retired now. 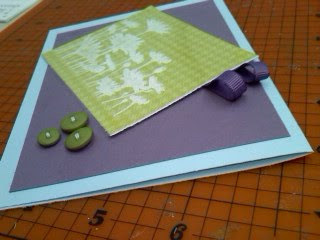 I had the Eggplant CS and Bashful Blue cut and ready for another card, and when I put them together, I liked the look. I got some great crafting done over the weekend. Its like I got my Mojo back!